Simon & Schuster/Paula Wiseman Books, 9781481402248, 32pp. A little boy and two dragons discover what really matters about friendship in this charming picture book from the author of Me Want Pet and Mostly Monsterly. With scissors and tape a boy transforms himself into…a dragon! “ROAR!” he says. He is BIG. He is SCARY. Well, not really. When two dragons come over for a play date, what on earth will these three find to do together? The boy doesn’t have big teeth and he can’t breathe fire. He is just a boy. And the dragons can’t eat ice cream or do cartwheels. They are just dragons. Luckily, the dragons care more about what they all can do together, like make silly faces and do the funky monkey dance. What they really care about is being friends. 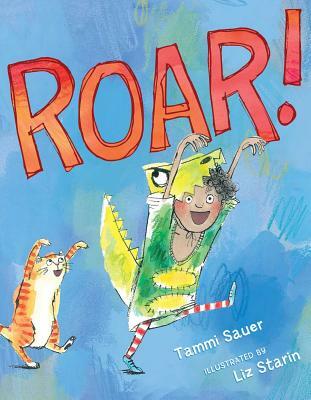 With simple, humorous text and classic, expressive line illustrations, Roar! is fun, short, and ready to be shared again and again. Tammi Sauer is the author of Mr. Duck Means Business, Mostly Monsterly, Chicken Dance, Cowboy Camp, and other books. She has worked as both a teacher and library media specialist. She lives in Oklahoma with her husband and two children. Visit her at TammiSauer.com. Liz Starin studied illustration at the Fashion Institute of Technology and the Hochschule für Grafik und Buchkunst in Leipzig, Germany. Before turning to the creative side of children’s books, Liz was an editor with Junior Library Guild. She currently works as a software developer and lives in Brooklyn. Visit her at LizStarin.com. Who said St. George had the last word when it comes to dragons? Not Sauer's mite, nor his fire-breathing friends. A ragamuffin makes himself a dragon costume. He may look like one of the lads from Sherwood Forest, but he plays the part of a dragon well. Well...not so much when two real dragons drop by for a visit. "ROAR! Look at me, look at me! I'm a dragon." "No. You're not," says a dragon. Why, I tower over my cat, I'm toothy, I breathe fire, the boy...well...suggests. Take a look, the dragons suggest in return—not at all superior about their talents, but there's no doubting who's a dragon and who's a kid. "Waaaaaaaaahhhh!" wahs the kid, sealing the fact he's no dragon. But look what you can do, the dragons say: play hide-and-seek, turn cartwheels, and eat ice cream (the dragons dismally fail at all these). "Waaaaaaaaahhh!" wah the dragons, jeopardizing their dragon status with all the wahing when it dawns on them what they are missing. No one likes to see dragons cry, so the boy points out their commonalities: they can all make silly and scary faces; they can all do the funky monkey. What more, really, do friends need, other than to share time and do weird things? Friendship can be pretty simple, at least at the start, and Sauer—along with some glittering, inviting artwork from Starin—is an encouragement to jump in, despite the incongruities, maybe even because of them. Big hearted, heart gladdening, and—best—a light-hearted approach to finding friends. A young boy, draped in a dragon costume, is convinced he was born to play the part of a dragon. That is, until two actual dragons appear and negate all the ways the boy thinks he fits the bill. He is not big, scary, or fierce enough. The boy’s discouragement at this revelation prompts the dragons to point out all the ways that being a boy is cooler than being a dragon, which in turn leaves the dragons discouraged. Will the boy and the dragons ever find common ground? Sketchlike illustrations polished with watercolor make this title vivid while maintaining a childlike, hopeful quality. The resolution is particularly clever and fun. VERDICT A solid purchase for collections needing whimsy, dragons, and friendship-despite-differences tales.